I'm going to be writing about this trip in the next issue of Alert Diver (Quarter #3, 2010) so I have to hold back my favorite shots from posting here. But, as a shout-out to an excellent boat and stellar crew, I wanted to give a visual salute to the photo-ops they provided a couple of weeks ago, off North Sulawesi, Indonesia. Wreck divers get ready, the USS Kittiwake is coming to Cayman! In a noisy shipyard in Norfolk, Virginia, a small army of workers is cutting, grinding, hauling and cleaning as the ship enters the final weeks of preparation before being towed to Grand Cayman. Tim Mullane and Sean Bowman from American Marine Group showed me the ship recently, and it was apparent this is going to be a great dive for many reasons. First of all, the site for the sinking is superb – shallow, clear and close to the beach. Second, the ship is an excellent choice – it’s heavily built so it will last underwater and it has lots of structures and compartments. Third, the clean-up has been extremely thorough. According to Tim, the goal is “not even a sheen when she goes down.” Fourth, the preparation for diver access has been equally painstaking. Thousands of brackets have been ground off flush to prevent snagging and huge openings have been cut through the ship to allow complete access fore and aft and from keel to stack. Instead of simply gutting the ship, the interesting items such as engine blocks, winches, boilers, cranes and compressors have been removed, cleaned and re-installed. On the bridge you won’t just find a sanitized compartment, you’ll see the radar housings, the helm and other equipment. Below, you’ll find the recompression chambers – hatches welded open – and vast banks of air tanks. A lot of people have put a lot of work and poured a lot money into this project, but the result is going to be spectacular! A tentative sink date for the KITTIWAKE is January 5, 2011. So, here's the idea. Let's illustrate a guy floating in a Uniroyal tire, just as if it were an inner tube like we used to float on in the lake when we were kids. That's a fun kind of concept that could be used to inspire participation in a tire dealer contest where a prize would be a vacation ... fun in the sun and all. Fair enough, except that tires don't float. They sink. And they especially sink when you put a 180-pound guy inside. 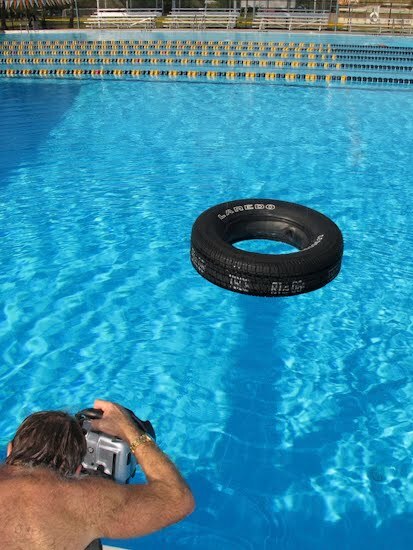 So, that was the logistical challenge when Rachel Rein of Hill Holliday agency in NY called to ask about shooting an over/under photo of a guy floating in a tire. No problem, I figured. We'll put that inner tube inside the tire, just like the old days before tubeless tires, and it will float. Well, the tire floats now. So far so good. Very unstable once we try to put the model inside. Not so good. Clock is ticking and we don't have a stable platform (tire) for the model to sit in. Thankfully, model Britt Bradford was as good natured as he was photogenic, and he was game to try most anything we had to do to make the concept work. OK, well if we can't float the tire, how about suspending it? 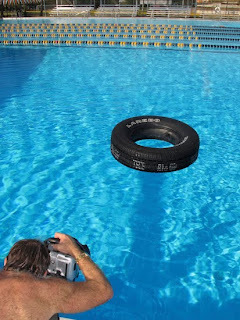 We tied the tire with monofilament line to the 3-meter diving board. After all, how hard can it be to remove a few lines in Photoshop once the shoot is done? Easy for us maybe, but not so comfortable digging into Britt's shoulder's constantly. Oh well, no complaints from him. Now I was ready to shoot, but the balance was still tricky, so an in-water assist helped to stabilize, and and you can see Gray Taylor, the AD on the shoot is in the water in the pool with the talent, helping the model to stay balanced in the tire, while the swimmer with the kickboard adds some dimension to the over/under water interface, just so it wasn't too flat and "pool-like". The beauty of digital image capture, in this case with my Canon 1DsMKIII and Seacam housing (with swivel-45 degree viewfinder so I could work from poolside without actually having to be in the water) is that the client can review the shoot instantly. A digital tech would download the images from my card and the art director and client would review right there at the pool. We changed a few things as the shoot progressed, but they were small tweaks rather than seismic concept shifts. Rachel and Gray knew exactly what they were looking for and provided very specific comps, so my job was all the easier given their excellent preparation. We got the shot easily enough, and plenty of alternates that would have worked as well. But, this dealer contest wasn't about winning a trip to Jacobs Aquatic Center to float in the diving well. We needed some tropical fish to place into the scene via Photoshop composite, to tell more of a adventurous getaway kind of story. No problem there either, because Gray visited my studio a little later that day and we went through my digital archives to find the right ocean and scenery for our Uniroyal composite. This one happened to be French Polynesia. The digital retouching was the brilliant work of www.mindseye-atl.com. Our first collaboration, but hopefully not our last. Very talented shop. Thanks to Barbara Doernbach for advance logistics, Rachel & Gray for keeping the creative on track on location, the gang at Jacobs Aquatic Center & Uniroyal, digital tech Liz Johnson, and tire wrangler Phil Darche. It was a fun shoot, and a very creative execution by the agency.